The cathedral of the Abraham monastery Transfiguration, 1755, and the Chamber, XVIII c., — object of cultural heritage of federal importance. It includes: the Cathedral of the Savior Transfiguration, 1753-1755 (M. Zhukov Street, 27), monastic cells, 1770’s (M. Zhukov Street, 22), abbot’s cell, 1770s. (M. Zhukov Street, 22), teachers cells, middle of the 1770’s (M. Zhukov Street, 18), Librarian Chamber, 1770’s. (M. Zhukov Street, 20), the building of the Seminary, 1770. years. ( M. Zhukov Street, 27). The first building of the monastery complex Abraham appeared at the beginning of the XIII century, and immediately turned the monastery into a kind of cultural and educational center of Smolensk. That is not surprising: the first abbot was Abraham, who was already known as the righteous in that time. His abode took only «after the great test on the books.» After 1611, during the time of Polish rule, the monastery fell into disrepair, the relics of St. Abraham had disappeared, the library was carried off. In the XVIII century, was built a stone monastery complex Abraham, and it opened the seminar. Later, here studied a well-known soil-scientist V.V. Dokuchaev and science-fiction writer A.R. Belyaev. The compositional center of monastic buildings is the cathedral church of the Transfiguration — the most prominent monument of the Baroque architecture. Here you can see a noticeable Ukrainian architecture influence in its great aspiration to the increased elegance. According to the «Life of Saint Abraham of Smolensk», he was born in a large family: he had twelve sisters. Since childhood, the boy stood out among his peers. He was not involved in childish games and amusements, and as soon as he learned reading, — he began to read books about saint righteous, the Orthodox faith, he delved into reading. The boy spent a lot of hours in the temple — he came earlier and went later, than others. Abraham had a memory which affected everyone around him. He quoted Ephrem and St. John Chrysostom by heart, read the works of Greek and Latin authors. The parents decided to marry there son, chose a bride for him, hoping to return the boy to worldly life. But Abraham refused to marry. When his parents dead, he gave all left properties to the poor, and went from the city to the Virgin Monastery. The knowledge, obtained from the books, natural intelligence, excellent speaking skills, tenacious memory — all of this attracted laymen to him, people came to hear his instructive preach, and to get good advice. For this popularity among the laymen Abraham’s was expelled from the monastery by his envious fraternity, after which he returned to the city and was taken to Smolensk Holy Cross Monastery. Abraham was a good painter, like all the painters of that time, he painted icons with biblical subjects. He wielded not only the brush, but the pen, too. His work «The Word of the heavenly bodies» came to our days. The Smolensk educator reached out to convey his knowledge and skills to the students, who copied the books and were engaged in iconography with his help. Abraham had enemies in Holy Cross Monastery, too. They announced that he was reading the books of the devils, that he was engaged in false prophecy. They said, he was a heretic, but not a righteous. Parishioners believed in this vile awnings, they required the punishment against the one, they recently came for advice, whose word trusted, whose sermons listened with bated breath. Declared as a heretic, Abraham stood before the prince’s court. He refused protection from the outside, it means, from legal aid. Calmly and convincingly he proved his innocence. However, just in case he was removed from Smolensk, sent into the Virgin Monastery again. 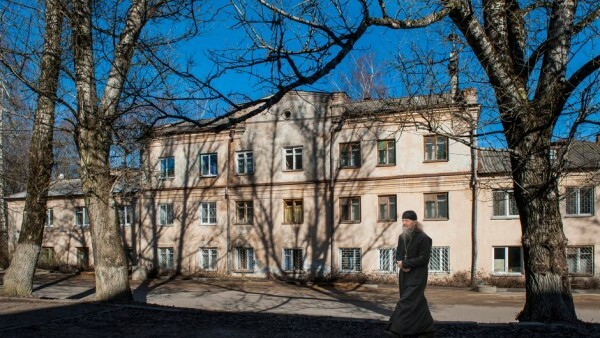 This wrong decision angered the higher forces: for three years in Smolensk there was no rain. The sources were dried, the earth was hardened and became like a stone. The hunger and devastator began. And then the citizens remembered how badly they treated with the righteous. They sent a delegation to him with a request to intercede for them, stupid and envious. Abraham questioned («Who am I, a sinner, so that because of me, the God became angry and started to punish?»), but anyway he began to pray the God to send down rain at the Smolensk land. And the miracle happened: the downpour flooded out. The building stands in the eastern part of the city within the ancient city walls on the crossing of the Furmanov Street and Marshal Zhukov Street, and it reflected on the monument planning configuration. The building belongs to the monuments baroque architecture of XVIII century. It is historically included into the Abraham monastery ensemble, but is outside of the buildings group core. It is currently used for housing. Chamber Library is a part of the Abraham monastery ensemble and is situated in the eastern part of the city, next to the wall of the Smolensk fortress. The building is a rare type of architecture Smolensk library and cellular buildings of the Baroque period of the 70’s XVIII century. The building is currently used for housing. 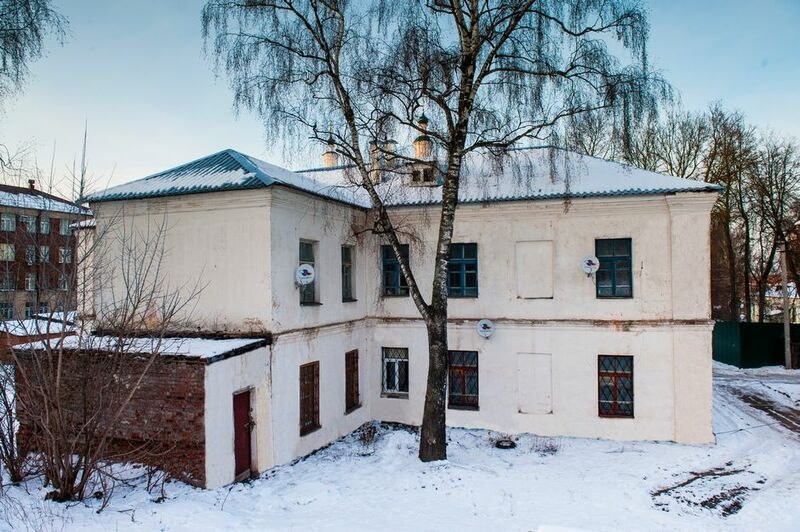 Teachers’ cells are included in the Abraham monastery ensemble, which is located in the eastern part of the city next to the wall of the Smolensk fortress. The building of teachers’ cells is located more western of the library cells building. The building can be attributed to the monuments of the residential monastic architecture of baroque 70’s XVIII century.